International Business Machine hired architect Eero Saarinen to design a huge and striking egg shaped pavilion that towered 90 feet above the fair and its surrounding grove of 45 rust-colored metal trees. Below in the grove were exhibit courts, a maze of walkways suspended above a reflecting pool, and a pentagon of little theaters where puppets performed. 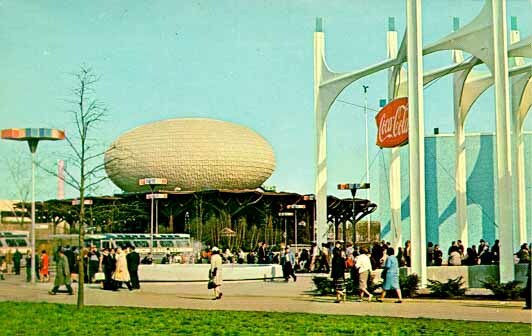 IBM's pavilion was a huge ellipsoid shaped theater 90 feet above the fairgrounds. 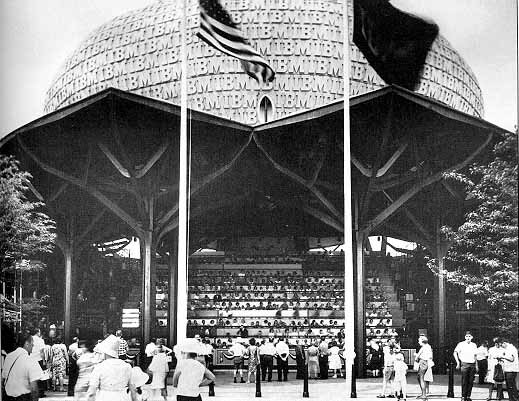 But it was the huge ellipsoid shaped dome theater high above, covered with the letters IBM repeated 1000 times that was the pavilion's attraction. The audience entered a steep grandstand known as the "People Wall." After 500 people were seated, the entire wall, guided by tracks rose upwards and smoothly into the theater, while a narrator appeared, suspended before them on a small circular platform. The show, a 12 minute multi-media delight by noted designer Charles Eames, used 14 slide and movie projectors, special lighting effects, and stereophonic sound to demonstrate how the human mind (itself a computer) solved problems. The screens of various shapes and sizes surrounded the audience and information bombarded them from various directions. The screen, front and center, showed all a person's brain interpreted information from its senses (represented by the peripheral screens) and acted upon them. To an audience that had never encountered anything like this presentation, it was mind-blowing. A grandstand seating 500, called the "People Wall," transported the audience into the huge egg shaped multimedia theater above. The displays in the grove below showed computer applications; translation of technical reports from Russian into English, and a computer's ability to recognize hand written characters. There was also a Probability Machine (operated every 17 minutes that demonstrated the law of averages by dropping 1000 small balls through a maze of 450 pins. The balls, bouncing from pin to pin, accumulated below in 21 pockets. It showed at the end of the experiment that each pocket held approximately the same number of balls that it held the previous time.